Well then, it’s time to behold the metallic artworks of Beatriz Ball – few eyes would ever call these lustrous objects anything less than gorgeous! But their beauty goes beyond their opulent looks: it lies within the handmade nature of each and every piece. In 1991, Beatriz Ball began to work hand-in-hand with local metalware artisans on the outskirts of Mexico City in order to create modern, innovative wares in a special multi-metal alloy. Many of these artists continue to work with Beatriz Ball today, creating brilliant products one by one using the ancient art of sand casting. This means that each and every Beatriz Ball piece is made by pouring a premium alloy of molten aluminium into a sand mould, after which it goes through four levels of polishing to bring out its reflective gleam. Invite the majesty of the seas into your table settings with the new Ocean Mussel Platter from Beatriz Ball. 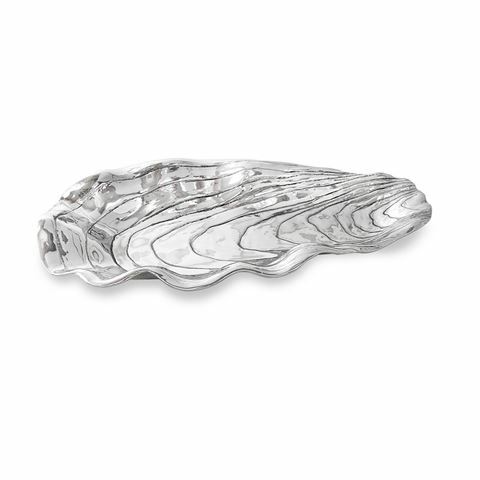 Boasting the brand’s signature high-gleam finish, this stunning serving piece features a seashell-inspired design complete with intricate detailing and is the ultimate vessel for plating up your seafood dishes. Made from eco-friendly, 100% recycled aluminium. Polished to a bright finish. Seashell-inspired design with intricate detailing. Perfect for serving up seafood dishes. Hand wash and dry recommended. Dimensions: Approx. 46cm (l) x 26.5cm (w).